The graph below (Fig. 2) is from the Rode et al. paper, showing sea ice coverage changes over time according to their chosen metric – “mean summer ice concentration.” This bizarre metric makes it impossible to tell how long the critical spring feeding period was in any year. The length of the spring feeding period, defined by how early or late the ice breaks up in mid-to-late summer, determines to a large degree the amount of fat bears are able to accumulate before the on-shore fast. 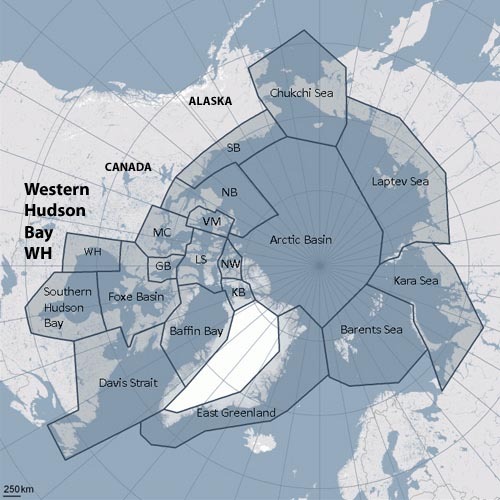 That is why breakup dates are deemed to be so important for Western and Southern Hudson Bay (see previous post here) and logic dictates breakup date should be the metric used for Baffin Bay and Davis Strait. Figure 2. This is Fig. 2 from Rode et al. (2012), showing “mean daily summer sea ice concentration (May 15-October 15)” in Baffin Bay (top) and Davis Strait (bottom). The years of study are slightly different for the two areas. The anomalous high value for Baffin Bay in 1996 appears to be due to earlier-than-usual freeze-up, which almost filled the Bay with 60% ice by October 15 (according to Cryosphere Today ice maps). 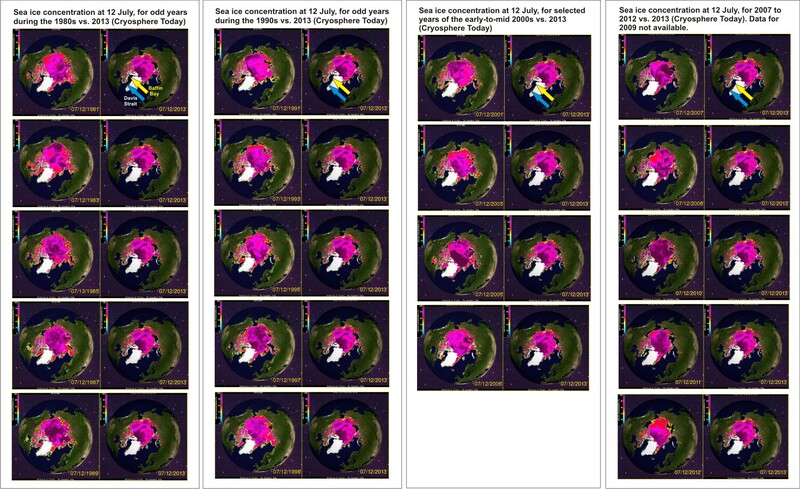 Below is the composite ice concentration charts from 1981 to 2013, at July 12. You’ll have to click the image to enlarge it enough to see the details. Figure 3. Sea ice concentration maps from Cryosphere Today compares the sea ice extent and concentration values for 2013 on July 12 to selected years from 1981 (the earliest available) to 2012. These maps are bundled into: 1980s (odd years); 1990s (odd years); early-to-mid 2000s (odd years plus 2006); 2007-2012 (2009 data is not available). At the top of each row, yellow arrows indicate the approximate location of Baffin Bay, while the blue arrows indicate Davis Strait. Click to enlarge. Here is what I see in Fig. 3 regarding Baffin Bay ice: only 2011 and 2012 had very low amounts of ice at July 12; the extent of ice in Baffin Bay in 2005 was higher than in 1992 (see Figs. 4 and 5, below), which was a late breakup year in Western Hudson Bay (see previous post here) and Davis Strait. In addition, for every year except 1981, 1985, 1999, and 2007 through 2013, ice in Baffin Bay extended shore-to-shore, from Greenland to Baffin Island, on July 12. This means that until very recently (2011/2012), there was ice in Baffin Bay available to polar bears until mid-July. Indeed, for most years (until 2007), there was a lot of ice remaining at this date – even though Davis Strait bears had little or no ice available. This also means that the statement made by Rode et al. in their paper, that both Baffin Bay and Davis Strait are ice-free in most years from “August through mid-November,” implies a similarity of ice coverage that is simply not true. Davis Strait has been virtually ice-free most years by mid-July at least (and perhaps sooner, some years), as Fig. 3 shows, and a quick survey of ice maps for November 15 year-by-year at Cryosphere Today (not shown) reveals that Baffin Bay has been half to three-quarters filled with ice in mid-November for virtually all years (i.e., not even close to ice-free). In other words, most years Davis Strait is ice-free weeks before Baffin Bay in the summer and Baffin Bay has significant amounts of ice in the fall before Davis Strait has any – which means that overall, Davis Strait bears spend more time fasting on shore in the summer and early fall than Baffin Bay bears. Below are close-ups of two ice maps, one for 1992 (an early breakup year in Western Hudson Bay), Fig. 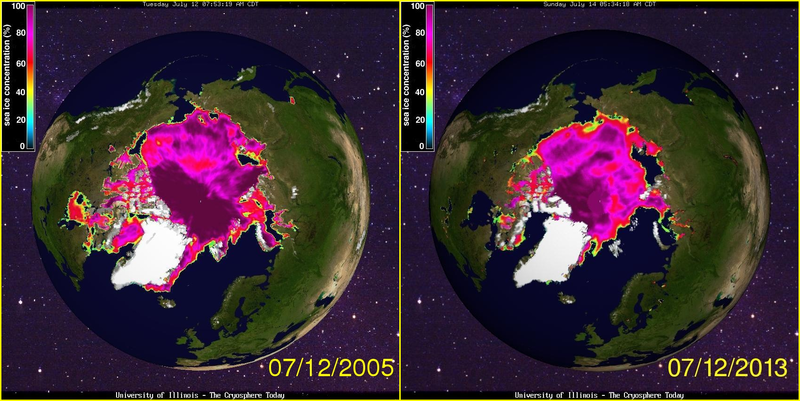 4 and another for 2005 (when there was even more ice in Baffin Bay than in 1992), Fig. 5. Figure 4. 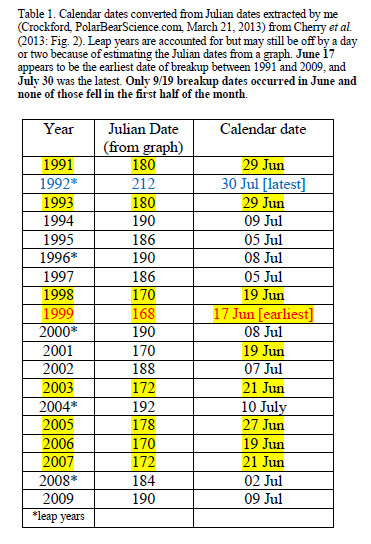 Sea ice concentration maps from Cryosphere Today to compare the sea ice extent and concentration values for 2013 on July 12 to that of 1992 (the latest breakup year for Western Hudson Bay in the 1991-2009 period, see Table 1 in the appendix below). Note that there was ice even in Davis Strait that year, which is rare for mid-summer. Figure 5. Sea ice concentration maps from Cryosphere Today to compare the sea ice extent and concentration values for 2013 on July 12 to 2005. Note that there was more ice in Baffin Bay in 2005 than in 1992 (Fig. 4); in 1992, there was more ice further south. 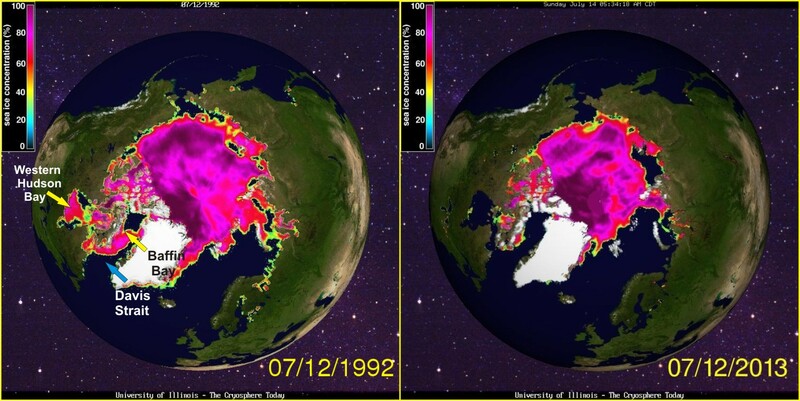 Notice also how much more 100% ice (dark purple) was concentrated in the central Arctic in 2005 compared to 1992. It’s apparent from these maps that the much later summer breakup of ice in Baffin Bay ice compared to Davis Strait is what Rode and colleagues don’t want us to see. They want to convince us that ice has been declining similarly in Baffin Bay and Davis Strait since 1990 because it allows them something to correlate their comparison of body condition changes over time in the two regions. The ice maps show that Baffin Bay retained sea ice for several weeks longer in summer than Davis Strait for virtually all years between 1981 and 2010, which means ice conditions in the two regions aren’t nearly as similar as Rode and colleagues would like us to believe. It also means that prior to the on-shore summer fast, Baffin Bay polar bears had more time to accumulate body fat than Davis Strait bears — a fact hidden by the “summer sea ice mean” metric. More importantly, however, using a unique ice metric for Baffin Bay and Davis Strait also makes it impossible to directly compare sea ice changes and polar bear body condition data from Baffin Bay and Davis Strait to data from other seasonal ice regions, like Western and Southern Hudson Bay (see previous post here). Why they would hamstring such efforts escapes me at the moment but I’m sure it will become clear in time. I’ll explore what this all means to the body condition and status of Baffin Bay bears in my next post. Table 1. 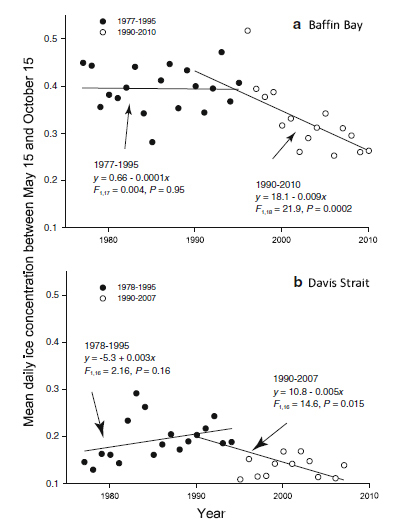 Breakup dates for Western Hudson Bay 1991 to 2009, as defined by Cherry et al. 2013. Details in previous post here. This entry was posted in Life History, Sea ice habitat and tagged baffin bay, breakup dates, Cryosphere Today, Davis Strait, Karyn Rode, sea ice concentration, sea ice extent, Seth Cherry, Southern Hudson Bay, summer ice minimum, summer sea ice mean, western hudson bay. Bookmark the permalink.